Every day we get numerous queries from people who want to sell their Native American Jewelry. The buying selling process is outlined in the article. Do We Buy Used Native American Jewelry? Most often it involves 5-20 pieces but we have purchased 1-1600 piece collections. We only purchase authentic Native American made items. There is usually a back and forth of 5 or 6 emails where I look at photos and the seller’s asking price and then if the lot is something we think we might purchase, the seller sends the items to us for a formal appraisal and offer. Well in the last little while we have received some unusual unsolicited packages. And honestly, it makes me sad for the people who sent them, so in hopes of avoiding future mishaps like this, I’m sharing a few stories. Seven pounds of costume jewelry, or what is sometimes called “junk jewelry” arrived from someone we had never had any contact with. It was all the stuff that is in the big tubs at the thrift stores. This photo is not of the actual stuff but gives you an idea of the tangled mixture that arrived. Inside the package was a long, hand written letter saying she knew it was really valuable and if we wanted to make her an offer etc…….well…….we didn’t even open the large zip lock bags as we weren’t interested in one single piece. We could tell just looking at the items through the bags, no Native American items, nothing sterling silver, just a jumble of silver tone stuff, lots of fake pearl bead type things – you know. So we wrote the woman a letter snail mail telling her she sent the package to us without prior contact with us or authorization and that it would now cost her $15.95 to have us ship the stuff back to her, otherwise it would be donated to Goodwill. After a number of weeks, she sent us the money to ship the items back. We put the box as it was with all its contents inside another box and returned it to her. Then four months later she contacted us asking where her Navajo Pearls were, that we didn’t return them. Wow. Hello?? A package from an unknown person was sent without any prior communication. It had 2 ounces of jewelry in it that would have cost $1.60 to send First Class but it was sent Priority, costing the sender about $6. None of the items were Native American made and none were sterling silver. 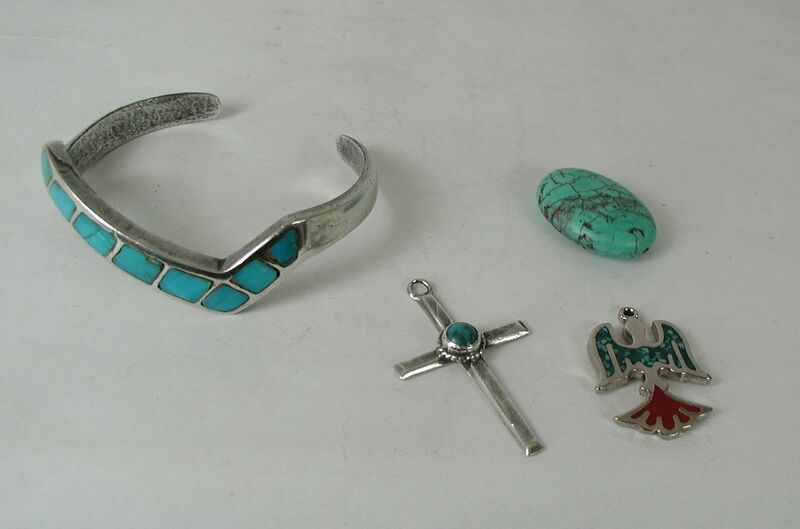 Just a cast metal alloy of some kind and a block turquoise bead – sorta Native American “style” items. So again we wrote snail mail, that to have the items returned, she would have to send us a money order or the items would be discarded or donated. No reply, so after 2 months, the items were tossed. Sad because the sender could have given the items to a child or friend who might have enjoyed them. And saved herself the $6 it cost her to ship the unsolicited package to us. This one takes the cake and is what got me to write this article. Again someone sent us an item without contacting us first. 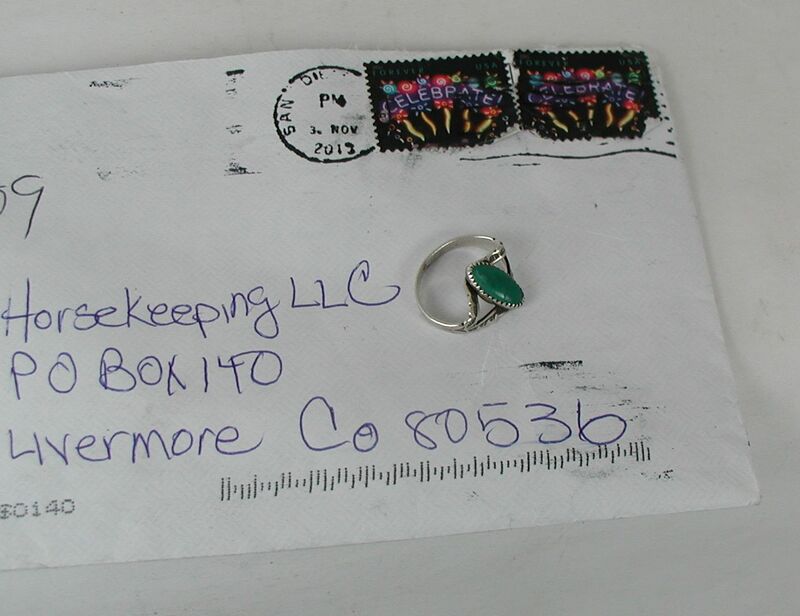 They mailed a ring to us in a regular letter envelope !! Well you can see what happened to the ring when it went through the letter cancelling machine. (I used to work at the Post Office so I know first hand what happens to letters.) The stone in the ring is cracked in half and the ring is smashed flat. The note provided us with the bank account number and routing for the deposit she was hoping we would make for the ring. Again, about all I can say is “Hello?”. And it is kind of sad, because once again, the person could have given the ring to someone for a gift, now it is trash. Moral of the stories. 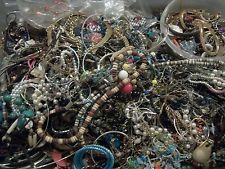 Don’t send unsolicited jewelry to us because if you do, it could get tossed or donated. You probably already knew that but I had to write this article so I could link to it on our selling information page.